Seeing as I was so successful completing items off my list from the first quarter of the Finish-a-long 2014, I have decided to take part again this quarter. I've got big plans for the next few months, but not all of them can't be shared on here just yet! My list looks pretty short and achievable. Dare I say that I'm feeling quietly confident that I can make good progress. This is expected back from the quilters any day now, so all I need to do is trim and bind it! 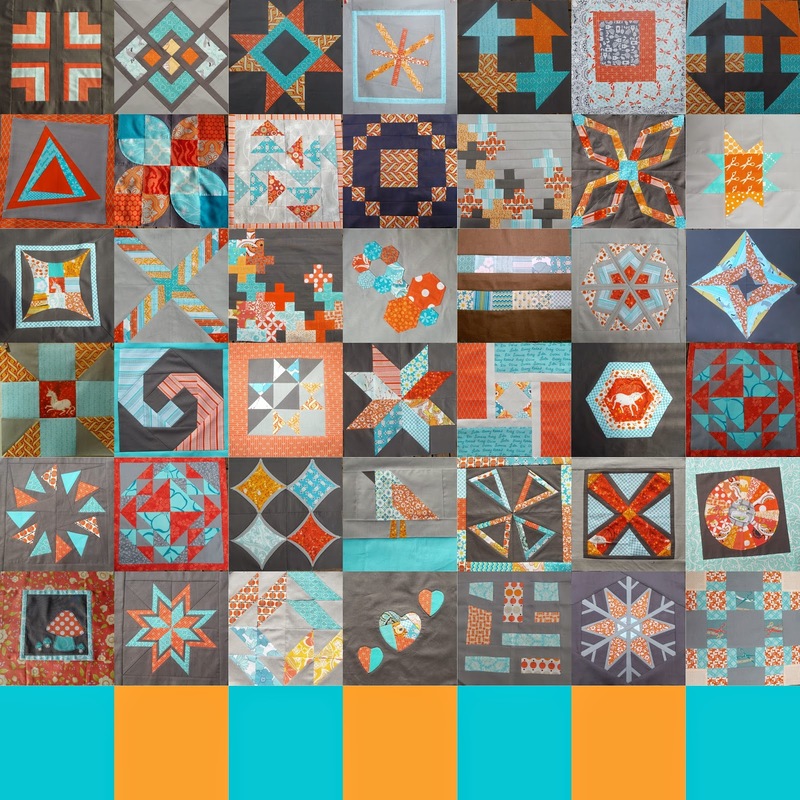 I am extremely excited by the sneak peak of the quilting that I have seen so far and I can't wait to see the whole quilt. If you see the colours of the bundle of amazing Oakshott Cotton that I am working with for this quilt, your first thought might not be butterflies, but I like using fabrics that are not the obvious choice. I have a plan; I have a timescale; I have started piecing. I just need buckle down and get this quilt sewn. 3. The Secret Squirrel project. 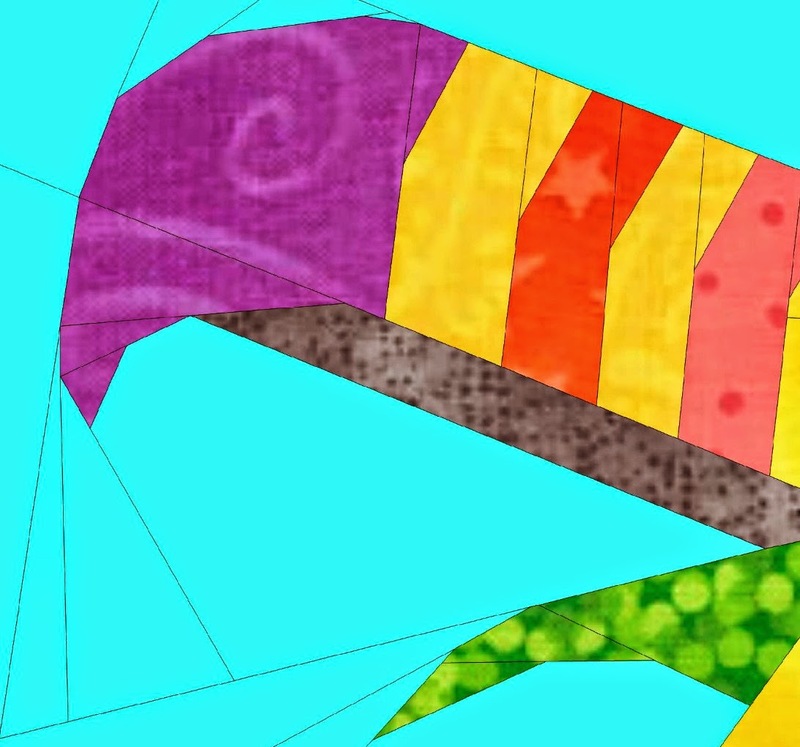 A Sneak Peak!- I'm not showing you any more at the moment! I have a new pattern designed, I have a pile of potential fabrics to use. I have a deadline... 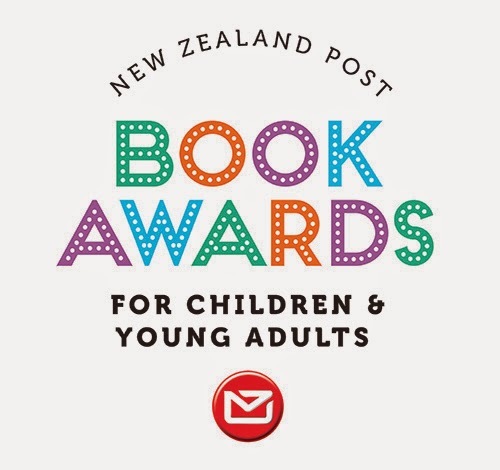 I don't want to reveal too many details at the moment, but what I will tell you is that I am working together with the team from the New Zealand Post Book Awards for Children and Young Adults and there may or may not be a giveaway involved! This one's a regular on my finish-a-long list! I really really need to take the sampler quilt out of the WIP basket and give it some loving. Its pretty close to being finished, I just need to trim the blocks; sew them together; sweet talk Deb into letting me use her long arm machine for the quilting; and then bind it. I have good hope that I'll manage three out of the four projects and I'd love to think that the fourth will get done too. Can't wait to see both the sampler quilt and the bird quilt finished !! !! !! 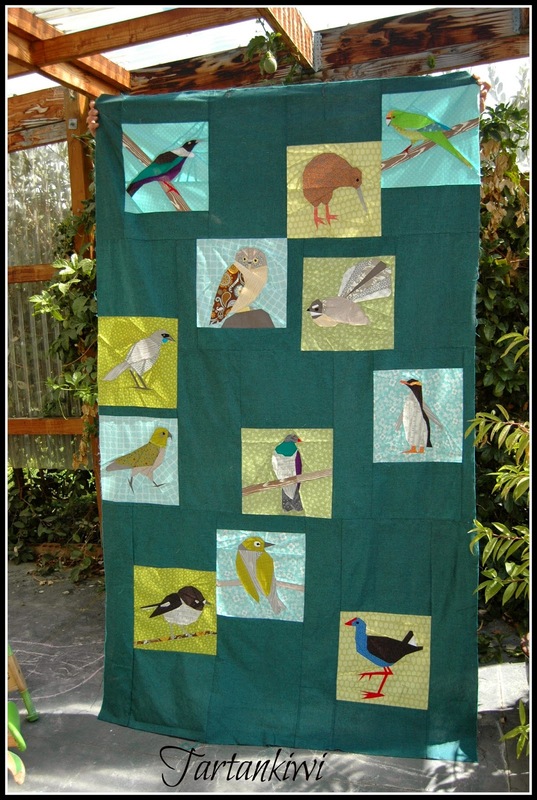 The bird quilt was a delight to quilt..........! You are a clever designer in your own right. The sampler is fabulous.......you must finish it, too nice to leave in the pile. These are going to be awesome!! So so canmot wait to see them and am super intrigued by the secret squirrel projects!! So exciting! I happen to like those colors for the butterflies. Wonderful Sampler quilt. I can't wait to see the Secret Squirrel project. The secret squirrel quilt looks interesting. Love the bird one of course and the oakshot cottons are lovely. That quilting is looking so beautiful! That Oakshott is going to be so pretty with the shimmers on the wings.